The third category can provide suitable product, but it takes some leg work, more than ‘due diligence’ to check the description for consistency and form an idea about its reliability, fit to the requirements and then value for money, seller reputation etc. This can be a lot of work for a few dollars worth of parts, but is a better option than category 1. An example of process for category 3 checks. 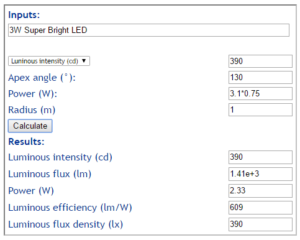 Above is the specifications of a seller’s offering for “3W super bright LEDs”. Of course there are many sellers offering exactly the same product with the same description and many at the same price. But, since my need was for white LEDs, lets extract the key information from the table. Headline power is 3W, 3.1V, 0.75A, 390,000mcd, 130°. 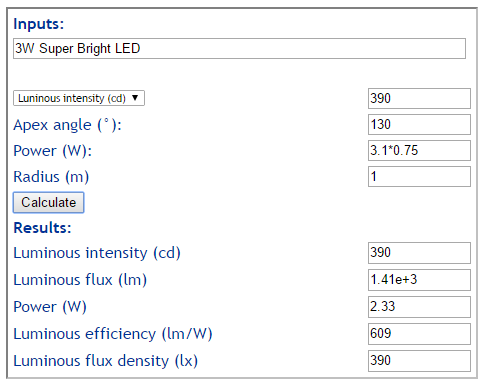 Lets feed them into a calculator (Calculate luminous flux (lm) from luminous intensity (cd) and apex angle (°)) and find the luminous efficiency, practical budget LEDs typically fall into the range 50-150lm/W, usually toward the lower end. 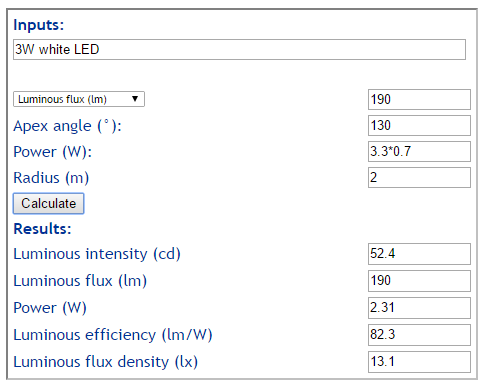 Wow, the data gives a luminous efficiency of 609lm/W, this is unbelievable, it is 10 times what is believable. Note too that the power input is less than 80% of the headline rating, but even if it was 3W, the calculated luminous efficiency would still be ridiculously high. It would be high risk to proceed with purchase, they cannot meet all of the stated specifications. Now as I mentioned, there will be scores of sellers using exactly the same description, the same graphic and most at similar prices. Above is the calculator result for another product offering. The calculated luminous efficiency is about as high as typical of most product, but believable. Again the power input is less than the headline 3W description, which highlights the need to select based on the luminous output rather than input power. 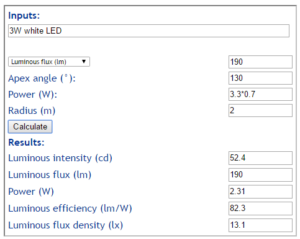 The project requirement is for luminous flux density of 10lx at 2m, and the calculator shows that should be achieved. None of this is to imply that there aren’t good quality products offered on eBay, but there is a lot of product with fraudulent claims whether the seller understands them or not. Buying success usually needs due diligence in carefully checking all aspects of product offering, and then preparedness to pursue a fair outcome if the product does not meet its claims.